What did you last dream about? Did you fly, punch an eagle, or play space chess? Whatever it was, it probably wasn't as neat as Anodyne, an indie spiral into the fantasy dream world of protagonist Young. 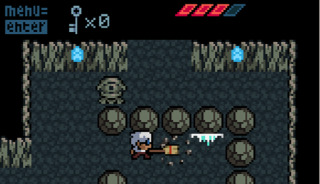 It's a top-down tribute of Zelda-esque dungeon derring-do with a 16-bit coat, and developer Sean "Seagaia" Hogan says item-based puzzles and challenges lurk aplenty for players.